Austal Limited (ASX:ASB) is proud to announce a milestone contract, valued at €126 million (A$190 million), to design and build two 117 metre high-speed vehicle passenger trimaran ferries for long term customer Fred Olsen S.A. of the Canary Islands, Spain. The aluminium trimarans, designed by Austal Australia, will be the second and third trimarans to be delivered to Fred Olsen S.A. who already operate the world’s first and largest trimaran vehicle passenger ferry, the Benchijigua Express – designed and built by Austal in 2005. Austal led the world in designing large aluminium trimarans for the ferry industry to answer a desire for improved passenger comfort over traditional catamaran designs. This innovation led to the development of the Littoral Combat Ship (LCS) for the US Navy and is a capability in which Austal is the world leader. Austal Chief Executive Officer David Singleton thanked Fred Olsen S.A. and the Olsen family for the company’s continued partnership and investment in Austal’s innovative trimaran technology and shipbuilding expertise. "It is truly exciting to announce this major shipbuilding contract with Fred Olsen, who had the courage and foresight to work with Austal’s advanced trimaran technology in developing the Benchijigua Express in 2005," Mr Singleton said. 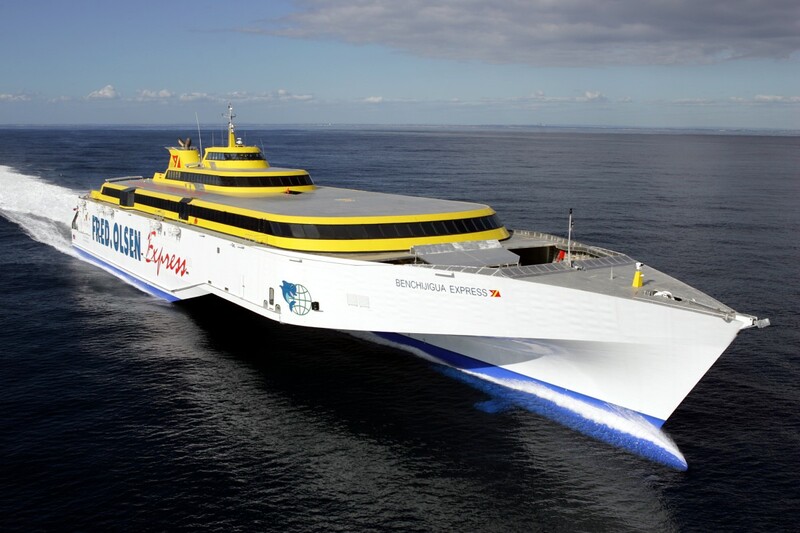 "The Benchijigua Express has become an industry benchmark for blue-water commercial ferry operations, exceeding expectations for performance, speed and customer experience in the Canary Islands." Austal Vice President of Sales and Marketing Ben Marland added: "This is a watershed contract for our next generation trimaran design that will deliver new levels of seakeeping, passenger comfort and efficiency, and proves the trimaran is the right tool for the job in the challenging sea conditions of the Atlantic. It is a game-changer in the market." The two new trimarans will each be capable of transporting over 1,100 passengers and up to 276 cars at speeds of up to 38 knots, with both commencing construction in 2018. The vessels are due for delivery in 29 and 36 months. The build location for the vessels will be announced separately. In the defence market, Austal is on track with the construction of the first of nineteen steel-hull Pacific Patrol Boat Replacement vessels for the Commonwealth of Australia and awaits an imminent announcement on AustalFassmer’s bid for the A$3 billion Offshore Patrol Vessel project that will see 12 vessels constructed for the Royal Australian Navy from 2018. Austal is also announcing today the contract signature for LCS 30, the 15th vessel ordered by the United States Navy which will be built in the Company’s state of the art shipyard in Mobile, Alabama.